Growing up I was fascinated by the night sky. I had books and books about the planets, stars, and constellations. When I got straight A's in 3rd grade, my parents bought me a telescope as a reward and I vividly remember dragging it out onto our deck and oohing and ahhing at planets and lunar eclipses. 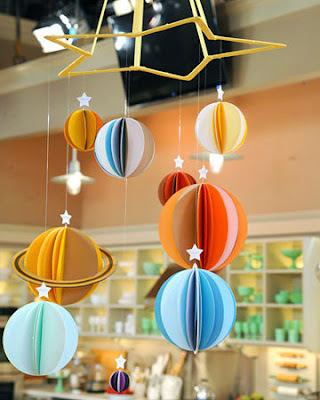 This colorful solar system mobile is a stylish addition to any nursery and an excellent way to introduce older children to the planets. The mobile's base is an 18-inch lighted star form that plugs into the wall. Forget our mobile with little animals and lullabies, this is so much prettier! that is a super cute mobile! This is awesome! I was an astronomy geek too...LOVED anything and everything to do with space and the planets and constellations. I'm in love! That is a super cool mobile! I love it. It's better than those glow-in-the-dark stars I use to have when I was younger, lol. I'm new to your blog - the title got my attention :) DH and I are geeks as well - he's a math/economics nerd who loves all things fantasy, and I'm a biology researcher and general nerd. We've been married a little over 2 years and JUST started TTC. I've enjoyed checking out your blog - your daughter is adorable and you have reviews that seem really helpful. @Allison - welcome and thank you! Glad to "meet" a fellow geek. Good luck in your TTC journey! I saw that mobile being made on Martha Stewart today online and wanted to do it with my son for his project. She said that the star was a 30' star from noveltylights.com. But, the star is no longer available. Is the star in that pic the one from her show? Did you make yours with an 18" star? I was afraid it would look to crowded without the 30". If you made it with an 18", were you pleased with the results? My son wants to do it with the light so badly.... Where did you find an 18" star? Thanks!